Every year, this time of the year is a challenging time for most students who are graduating from school. The expectation that is thrust on each by the families and society really takes toll on every child. It is very important to understand the child and help the child have confidence in himself or herself, in their capabilities. Through the school, facilitate the child to understand self and the world around, by exposing, exploring, experimenting, experiencing, imbibing in many contexts, across a variety of spaces in those eight intelligence dimensions – linguistic, logical/mathematical, spatial, nature, kinesthetic, Musical (read the article Every child is gifted). The world is looking for problem solvers and shall dish out anything to have such on their board. Money is never a problem. Be a learner for life time, have courage to push boundaries, to discover what more you are; Be humble in any given situation… So much more in this panel discussion with renowned career counsellor, Ms Pravin Malhotra. I always loved following, meeting or interacting with individuals who ride solo in their lives on their chosen path, towards destinations that they only are aware of. Each one of them is an entrepreneurial leader in his or her own right. But what do you say about an individual who literally rides solo to the farthest corners of the world, untouched and unchartered, to explore, embrace and enliven the lives of people. Gaurav Jani is one such person. Deepa, one of my friends from Delhi Drum Circle has always been different from most individuals I have met in my life. Though graduated from one of the best business schools of the country, she chose traveling and exploring the world as her purpose of life. I too love traveling. My Omni, Qualis and Scorpios, in the last twenty years, have been the catalysts and also have been at the receiving end of my long road journeys into wilderness. So have been my family, who have now become inured to my traveling and photography. Now, they too revel in such journeys. We have seen almost every state of the country, and measured the roads across – Kashmir to Kanyakumari, Kutch to Kohima. You will able to catch up with my travel in the passions section of my website. This love to travel has made me fall in love for Deepa and her work. A month ago, Deepa pinged me and shared about an exciting travel film of Gaurav Jani that is being edited now and wanted me to get her connected with my friends who may be able to help raise funds. She sent across all the links to the exciting work of Gaurav Jani and I was delighted to browse through. I was surprised when one day an invite landed from Deepa for the screening of the first film of Gaurav – riding solo to the top of the world – which Gaurav himself was presenting. I landed at Attic, the venue for the screening, to find it, as always, very inviting. A journalist was interviewing Gaurav, as I entered. And I realized, like most of the journalists I come across, she too has no idea about the person or his work. They are just doing their job! I loved listening to Gaurav’s answers to the questions of the journalist – philosophy about life and how these journeys have been satisfying and infusing the drive to do much more. His outlook connected with my philosophy and I thought of writing this small piece. Gaurav, also known as Jani, Bhatku (wanderer) or GJ, is the prime mover behind and directs films for Dirt Track Productions (DTP). Riding Solo To The Top Of The World is his debut film. Gaurav is a travel freak and a biker. He likes to collect antiques, but doesn’t have the money for it! 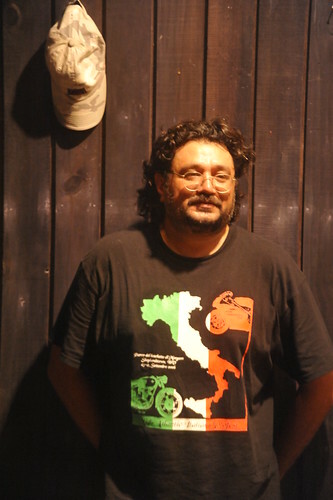 He is also the founder member of 60kph, Motorcycle Travel Club India. Gaurav functions as a one-man film unit to capture the true essence of travel and it’s highs and lows. He neither believes in planning nor research, preferring instead to trust his instincts and firm resolve. Sometimes things work out the way he wants and sometimes they bomb, but he doesn’t change. He likes to keep things simple and basic, letting his heart rule over his head. GJ has been an assistant to Ram Gopal Varma (RGV) in commercial films before he realized the futility of this masala world and jumped into realizing his dreams of making meaningful films through DTP. Now DTP has over half-a-dozen crazy people fueling each other’s dreams. While the world media has shifted towards drama, hype, scandal, lifestyle and oomph, DTP has consciously moved away from the mainstream to the dirt track, churning out films that inspire, motivate, enrich and at the same time mirror life. DTP makes films that not only satisfy each of them as filmmakers but also quench their thirst for travel and exploration. Dirt Track Productions was born when the co-founders were on a location hunt in the biggest tiger reserve of India and couldn’t find their way out. Ultimately they walked for 13 hours without food and water to get back to civilisation. Their main focus is to make films and documentaries on remote regions of the World. This gives each one a chance not only to explore new subjects but also to explore themselves by interacting with the people. They also scout locations and arrange logistics for films, photographers and ad-films for Indian and foreign production houses. The first film “Driving Solo To Top of the World” took about 7 years in post-production due to fund constraints. Now they have more or less figured out how they can go about in shorter cycle of time. But always in need of money to do a little bit more. For one who is crazy, money has never been a constraint! He or she will do it, with money or without! Gallerie Public Spaces, a set on Flickr. Most of the art, is confined to Galleries and Elite spaces. The artists aspire to be seen and heard in those spaces. Even the visual artist community, many of who themselves must have emerged from a very humble surroundings, does not go back to those spaces. The photo and painting world, the art world, like the fashion world, looks only in one direction – tags, visibility, rubbing shoulders with THE happening people and in HAPPENING places. After having seen and experiencing the HAPPENING world from close quarters, I wanted to do an experiment and exploration to enliven public spaces. Unexpected and unbeknown to the regular users of a public space, I curate a painting and photo exhibition in the place, that I study thoroughly to understand its usage by people – place, time of the day and activities. When they come without any expectations and to their surprise find the display of creative works, they are taken in and inspired. I did it in three parks in and around my place of stay, Sarita Vihar. Then I though, why not tax a little more and see how far I can go to study the acceptance of this concept. Went to Lodhi Gardens to put it up. The security stopped me from doing it and asked me to seek permission from Dept of Horticulture of NDMC as there are many ‘BIG’ officers who walk in the park and object to any form of using the park apart from walking and discussions!! I spoke to the director of NDMC. He wanted me to give things in writing and wait for the permission. For want of time, I stopped it at there. I wish I can push a little more. I am sure I can, If I can invest time. Nothing can be gained without shifting a paradigm. a. 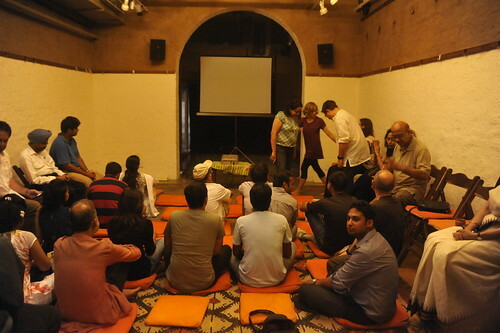 People loved it and very inspired by just a change in their existential space. It really changed their perspective of what parks can be! d. The the discussions went on to figure out how, we can make these parks and community spaces more exciting. This experiment has just been an extension of what I see and do in school and educational spaces. Can we not make each of these community spaces, THE HEART, of the communities. This concept can be compelling depending on the level to which we can take this idea and make real forays. While my endeavour continues in school space, would love to collaborate with a District Collector to make the shifts in a district and then replicate it across districts, state and the nation. On the Gallerie public spaces front, I am going to continue my explorations. I have now plans of creating a mobile gallerie; to do a van that can go around and surprise people in park, in and around Delhi.